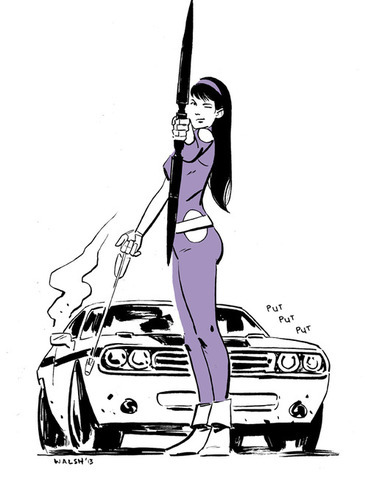 Team: Defenders For Hire, Inc.
Kate is born to Derek & Eleanor Bishop, with an older sister named Susan. Kate and Susan both went to boarding schools. Eleanor dies, devastating Kate. In an effort to make her mother proud, Kate continued her work with the poor. Kate is brutally attacked in Central Park while on a school trip. Nothing was reported to the police or the school. Kate spent months in seclusion, feeling helpless and defenseless. On her way to a visit with her therapist, Kate sees a flier for a self-defense course in the trash, the idea a catalyst for the change into a stronger woman. Kate took to the lessons easily, moving quickly into lessons in jujitsu, boxing, and other combat styles. Had been taking fencing lessons, along with the cello, for a good part of her young life. Began taking up archery lessons. 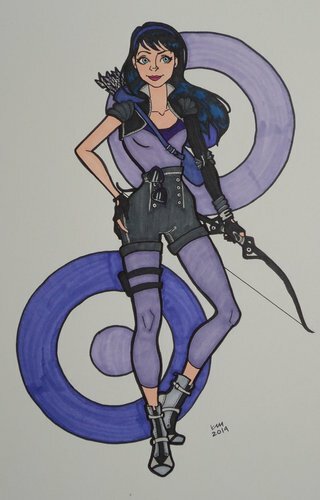 Kate excels at her archery lessons, surprising her teachers and bringing pride to her father for the first time. Kate goes to London for the 2012 Summer Olympics. She competes but was not good enough to earn a medal. Derek made sure that Kate had all the publicity that his publishing company could give her, and she still returned home a hero. Kate graduates High School and gets accepted into Columbia for Criminal Justice. Kate begins her new job as a hero, donning a disguise and patrolling Central Park. Kate is shaped by two things: privilege and past tragedy. She realizes she's lucky to have so much due to her family's wealth and she wants to give back to society and the community. On the other hand, being assaulted also now drives her to take a more active role in fighting crime and evil. Her focus on not allowing herself to be hurt makes it harder for her to get close to some people. Kate is very strong-willed. Once she makes a decision, she's quite unmoved. Like most of Kate's traits this can be good and bad. This means that she'll never back down and never give up, even when it looks like she's wrong, or that it will put her in danger. It seems as if she gets momentum, or is even more willing to stand up when the goal is set higher. Kate loves to dive into charity work, and other acts of kindness. This was built into her from a very young age, from when she would go with her mother to various charity works, and volunteer with different organizations. She didn't do it to make her look good, she did it because it made her feel good. As a superhero, she tries to find ways to continue that work, even if it has to be anonymously. Kate is self-sacrificing. A bit too willing to jump into danger. She doesn't have a death-wish, and she's not suicidal. She just feels responsible for every bad thing that happens, whether she was there to prevent it or not. She has no problem with stepping in front of a bullet if it would allow someone else to live. She has no powers. She knows she has no powers, and she still does not see anything wrong with that. If she can save at least one life, even at the loss of her own, she can consider it being even. Once Kate has her mind set, she needs to be really swayed to change her mind. Even when she sees that she's wrong, she has a hard time with letting go on a decision or stance. Kate's primary motivation is the protection of others. This stems from the time that she was attacked in Central Park at a young age. Everything she's done since then has been to make her stronger, and to make her able to take down anyone who tries to do the same thing to somebody else. She'll be a 'hero' for as long as she possibly can. Kate's goal is to help as many people as she can, focusing on those who can't fight for themselves. She runs patrols around Central Park and even does what she can to help the police in their investigations. When the police are totally off base, she takes a hand in the sleuthing herself. Kate's father, Derek, is a publishing mogul in New Jersey and Kate is an heiress to the Bishop Publishing empire whether she likes it or not. She uses this unique position to help finance her heroing ventures. 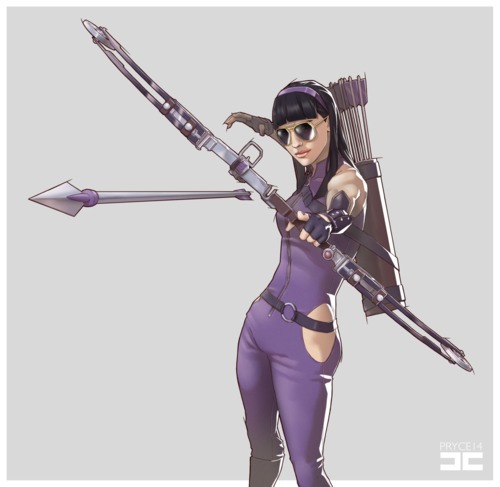 Kate prefers a sporty Compound Bow to other variations. It holds a 150lb draw weight and sends an arrow at 300 feet per sec. It's easy to carry over her shoulder, along with a quiver of arrows. It's a complex instrument, made up of many moving, mechanical parts and needs to be constantly tuned. If it does not stay tuned and oiled, it can fall apart, or become damaged, hindering Kate's Archery skill. She can shoot off up to 3 arrows in one pull. Along with the bow, Kate carries a quiver of about 36 arrows. All the arrows are made of the same alloy as the battle staves. She uses them from a distance, and mostly at non-human targets. Again, if shot at a being of living flesh, they could be fatal. Two sticks about two feet in length each made of a sturdy metal alloy. These are used close up, more for subduing criminals then for taking anything out. Her costume has sheaths for the sticks, one along each leg. Kate owns a purple VW Beetle and uses it for transportation everywhere. Kate has a decent apartment in NYC and she lives there when she's going to college and she's doing her hero stuff. Through Kate's brief time with the Olympic team, she still keeps in touch with other Olympians as well as the instructors and coaches. These contacts can't really extend much out of the realm of sports, but she can rely on them to help her with equipment or manufacturers. To those in the archery world or those who are fanatic about the Olympics, Kate is a famous face. Though she didn't win any medals, both her father and the US Olympic committee had no problem with using her as a poster child for the American cause in 2012. Her face even graced a cereal box for a week or so. Due to Kate's training in martial arts, along with her gymnastics training, Kate is an expert in acrobatics. Instead of focusing on a specific martial arts form, Kate has learned from a handful of styles. She can escape most physical holds and can handle multiple opponents. Kate tends to stay in the shadows. Not only is it a good defense for someone who isn't super-powered, it also helps with maintaining a psychological upper hand. She'd much rather scare away a perpetrator then lock into combat with them. Kate is a world-class fencer and uses those kills with a variety of sword and battle staves. She uses her skills to disable instead of kill, though she is capable of taking people down. 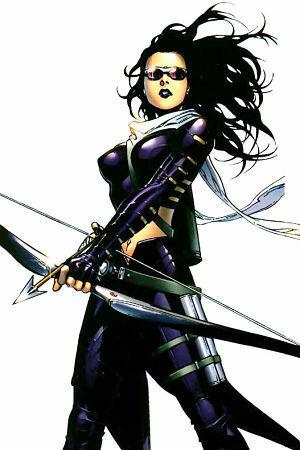 Kate is an expert archer, her skill is at Olympic level. Her compound bow is top quality. It holds a 150lb draw weight and sends an arrow at 300 feet per sec. She's deadly accurate up to 3 miles and she can shoot up to 3 arrows in one pull. Being the daughter of a multi-millionaire has it's perks. She gets to rub elbows with the elite of the elite across the country and she knows how to navigate her way through the Who's Who of rich, important people. She actually likes some of it, despite putting on the attitude that it's all beneath her. She enjoys attending functions and soirees and cotillions, and even knows how to spell them. Kate's not a slave to fashion, but she definitely knows her way around a runway. She can tell a Garavani from a Wang like guys can tell the difference between a Corvette and a Camaro. She tries to stay current with the fashion but not enough to be flashy. She typically donates her prior years clothes to charity. When Kate was in middle school, during a school trip through Central Park, she was brutally attacked, which was the catalyst to becoming the hero. She never wanted to be a victim again, and wanted to protect those that couldn't protect themselves. No one knows of this besides her family, and her therapist. Kate is not known to be Hawkette. She wears a mask to hide this. Her own family doesn't know of her extra-curricular activities, and it would be bad all around if her identity was made public. Kate's equipment is made of special materials, but even that material can give way after prolonged and extended use. Kate's not a teenager, she's reached her late teens/early twenties. However, she's still in college, and is considered far too young to be in the hero business. She's often sold short and misunderstood because of her age and inexperience. Kate's strength and reflexes are limited to the normal human limit of exhaustion. After using her abilities for too long, she becomes tired and eventually her system will shut down. Kate's relationship with her father is tenuous at best. Because she takes after her mother more and doesn't want to focus on the family business, Derek is disappointed in Kate. Kate cares more for the underprivileged and does what she can to help out charities and thinks that this is more important then helping her father's empire grow. Derek was proud of Kate when she was in the Olympics, but everything else she does is of minor importance to him, and he continues to pay for her ventures hoping she'll wake up from this whimsy some day and become a responsible adult. Kate is also resentful of the fact that she's had numerous step-mothers since the death of her mother.